I have come to the carefully considered position that Champagne is required at a Madeira tasting. The aroma of Madeira always fills the room but a glass of Champagne makes everyone jolly before sitting down. A bottle served while service is performed on the second flight refreshes the palate. Finally, a bottle at the end resets the palate for dinner wines. Sadly, two of our four bottles of Champagne were not as they should be. Fortunately, there were plenty of other bottles to occupy our interests. Imported by Envoyer Imports. Alcohol 12%. Good, integrated bubbles with focused flavors of sappy fruit. It finished with tart apples and acidity. Young with good promise. **** Now – 2033. Shipped by Allyn & Scott Wines. Imported by Wine Cellars LTD. Alcohol 12%. Some corrosion around the cork. A nutty straw color. The nose is mature and oxidative, a bit more advanced than it should be. In the mouth are fine, textured bubbles, dry apple orchard flavors, and exotic spices. The bubbles quickly dissipate. Completely drinkable but this bottle is probably heat damaged. Not Rated. Imported by The Rare Wine Co. Disgorged 20 November 2007. Alcohol 12.5%. An attractive, rather mature color. There are hints of yellow fruit in the mouth with yeast notes, and oxidative, tangy apple orchard notes in the finish. It is a little foxy and earthy with tons of acidity and a sharp finish. Not right. Not Rated. Imported by Louis/Dressner. Lot No. 10. Disgorged March 2014. Alcohol 12.5%. A light straw color. The very fine bubbles are perfectly integrated with piercing acidity and some tropical fruit. This wine has power with lemons and other citrus which puckers the mouth in the middle. The bubbles mix with baking spices leaving chalk in the finish and a long, textured aftertaste. Bracing stuff best with food. ***(*) Now – 2028. Imported by Espirit du Vin. Powerful, dry, white fruit flavors of apple and citrus with a good vein of acidity. Certainly a food wine. Tart overall but there is some Riesling flesh. This will be long-lived. *** Now – 2028. Imported by Meadowbank Estates. Alcohol 13.5%. A black cherry, Pinot nose. In the mouth are focused, fresh, and deep flavors of attractive black fruit which is almost bitter. Watering acidity carries black cherry and licorice towards the dry and herbal finish where tannins are left on the gums. The long aftertaste is clean. ***(*) Now – 2023. Shipped by Allyn & Scott Wines. Imported by Wine Cellars LTD. On the second night this is a seamless wine of brooding strength. The savory and salty start builds incredible depth of flavor backed by tactile sensation of extract. This is an inky, mouth coating wine with licorice, floral flavors, and new oak. This is an intense, modern wine. **** Now – 2033. Shipped by Andre Labarda. Imported by Majestic Wines & Spirits. A mature nose with leather aromas. It is off to a savory start with this medium bodied wine. There is a nice mix of fruit, both red and black, along with hints of floral perfume in the finish. I would drink these gentle wines now. *** Now. This offers a good nose of black fruit and leather. In the mouth is a linear delivery of black fruit, integrity acidity, and some greenhouse notes. Best within one hour. *** Now. At first this was gentle with foxy, simple flavors. But after an hour in the decanter it became mouth filling with darker fruit and a touch of greenhouse. Good weight. ***(*) Now. Darryl and Nancy organized a small wine dinner at the Woodberry Kitchen in order to partake in ramps and old Châteauneuf du Pape. Roland, Richard, and I joined them one fine evening this week. Fortunately we had extra bottles in tow for this evening was marked by an unfortunate series of off and underperforming bottles. A shame then that two vintages of 1983 and 1985 Von Schubert Maximin Grünhäuser, from two different sources were off. A 1981 Domaine du Vieux Telegraphe, Chateauneuf du Pape had a bad cork and despite a heroic effort by the wine to correct itself, it remained ultimately marred. The 1978 Chateau Cos D’Estournel, Saint-Estephe was more advanced than I had expected. Thus the white wine highlight of the evening included the fine 1992 Zind Humbrecht, Riesling Rangen de Thann Clos St. Urbain, Alsace which still needs air for full pleasure. It has a kiss of petrol followed by nuts and lively acidity. For the red wines my favorites include a 1982 Thorin, Confrerie des Chevaliers du Tastevin, Chambolle-Musigny. This represents a smaller and gentler example of an old-school mature Burgundy. I enjoyed my glass and would happily have this as a house wine. The mature Burgundy set the stage for a well-cared bottle of 1981 Chateau de Beaucastel, Chateauneuf du Pape. The last time I tasted this wine, my glass came from the dregs. This time I had a proper pour which I kept around for an hour or so. Good stuff! This deep wine should drink at its peak for several more years. In complete contrast the 1986 Chateau de Beaucastel, Chateauneuf du Pape is yet to reach full maturity, instead it offers brighter, fruitier red flavors. It will not achieve the depth of the 1981 but it does have that Beaucastel familiarity. Imported by Schneider’s of Capitol Hill. Alcohol 11%. A golden straw color greets. The flinty nose makes way to a rounded, slight dense start backed by glycerin. There are yeast and chalk flavors but the wine lacks verve from enough acidity. ** Now. This wine is a blend of 50% Pinot Noir and 50% Chardonnay. Bottled 07/07/2010. Alcohol 12.5%. The nose is slightly oxidized with aromas of apple orchard. The bubbles quickly become creamy with a fine vein of prickle. The flavors have strength with chalky, fruit, and a slightly bitter finish. It tastes fully mature. *** Now. Consigned from a private source to Zachy’s 2016 Rieslingfeier auction. Imported by Wine Cellars LTD. Alcohol 11%-14%. The nose is very aromatic and smells exactly like pure gasoline. There is a fruity start backed by the petrol note a bit of grip then the wine completely fades off. There is a strange lack of acidity. Not Rated. This also sports a bit of petrol on the nose. In the mouth is a nutty, bitter, and coconut start. This wine has ample acidity providing a lively start then drier middle before the acidity returns in the end. With air it fleshes out a bit to bring the acidity in balance. *** Now but will last. Acquired from private collection by Acker Merrall & Condit. Alcohol 11.9%-13.9%. There is sweet fruit on the nose then violets and attractive, sweaty leather aromas. In the mouth are sweet flavors that coat the tongue and a slight vibrancy. A small example of a well-tasting old Burgundy. *** Now. Robert Haas Selections imported by Vineyard Brands. This is in fine condition with sweet aromas and wood box complexity. In the mouth are gently sweet flavors of perfumed strawberry which eventually take on fat. There are pervasive flavors of leather, animale notes, blood, and an old-school perfumed aftertaste. **** Now – 2023. No signs of seepage but cork was loose with a bit of wine on top of it. Prominent volatile acidity and band-aids on the nose. With air it cleans up a bit but can’t shape it. The wine is fruity, supple, and weight but is marred by a band-aid flavor. Not Rated. Imported by the Rare Wine Co. Lighter in color than the 1981. In the mouth are surprisingly young, reddish fruit flavors, a grippy nature, and brighter acidity. This wine has both more structure and youthful grip. It is not yet at full maturity but is gaining fat. ***(*) Now – 2027. Shipped by Les Vieux Celliers. Imported by The Stacole Co. Dried banana on the nose. In the mouth this is more advanced with red fruit, bananas, old greenhouse infused flavors, and a short finish. ** Now. Acquired from a private collection by Chambers Street Wines. Imported by Schenk USA. Alcohol 9%. Signs of seepage and the cork dropped in the bottle. A beautiful orange color and attractive, scented marmalade nose. Sadly it is undrinkable. Not Rated. Lou and I gather the families every year for a pre-holiday dinner featuring mature wines. This year we were joined by Darryl and Nancy for whom mature wine is a bit of an obsession. To accompany the dinner of crab cakes, coq au vin blanc, and leg of lamb we had planned nothing more than opening a random series of mature red wines. This was then surrounded by a Champagne and white wine starter eventually to be concluded with a dessert wine. The Champagne was in the form of the impressively boxed 1990 Veuve Clicquot, Champagne Vintage Cave Privée. This is surprisingly fruity on the nose with precise flavors in the mouth that are supported by robust bubbles. There is only a touch of yeast and the sense of maturity really takes many hours to develop. It was a good showing. The white wines moved us onto experimental territory. The 2008 The Scholium Project, Naucratis, Lost Slough Vineyards is Verdelho on steroids. Unfortunately the 16.3% alcohol breaks through towards the finish as pure alcohol. No matter how seductive and correct the nose is, I could not get past the burning sensation in my throat. The 1998 Hugel, Riesling Jubilee Hugel, Alsace is only made in the best vintages. You get that sense from the lifted aromas on the nose but in the mouth the wine is starting to tire. Switching gears once again, the 1995 Pierre Morey, Meursault 1er Cru Perrieres is a wine for mature Chardonnay drinkers. The apple orchard flavors and bits of subtlety speak of maturation but the fat draws you back to peak drinking. Imported by Moet Hennessy. Disgorged October 2008. Alcohol 12%. The nose is quite pretty with a surprising amount of berry fruit. The fruit continues in the mouth but soon picks up lemons and baking spices with a touch of yeast. With air the flavors develop towards maturity. The wine has good precision to the flavors which are enlivened by fine, robust bubbles. This is more of a fruity wine than yeasty/biscuit wine. **** Now – 2026. Alcohol 16.3%. There is a rich, nutty, creamy, and seductive nose. In the mouth is a rich mouthful followed by toast and baking spices. The wine finishes spicy with a sharp, alcoholic jolt in the end. It starts of promising but is unpleasant by the end. *** for the nose but for drinkability * Now. Alcohol 12.5%. There is an attracted, lifted nose with lemons and herbs in the short finish. Interesting to smell but tiring out. ** Now. Alcohol 13.5%. The golden amber color speaks of maturity. In the mouth is an moderately dense wine with apple orchard flavors and spot-on acidity. It is clearly at its peak, with a suggestion of subtlety, that is briefly waylaid by the fat in the finish. *** Now. While Lou and I finished our dinner preparations we required some red wine. Together we had both stood up a dozen or so bottles to try which we arrayed on a desk. A fine looking 1976 Bitouzet-Prieur, Pommard was selected at random. I was curious about this wine, Pommard being the first mature Burgundy I ever drunk. This bottle is from the first year Neal Rosenthal began working with the estate. The significant amount of muddy looking mold under the capsule foretells disaster in my experience. While not completely gone the dusty, dirty aroma pervaded the flavor. Down the drain it went and out came the cork on the half bottle of 1969 Sterling Vineyards, Cabernet Sauvignon, Napa Valley. From the first released vintage, this wine was in good, though fully mature shape. Peter Newton and Michael Stone founded Sterling Vineyards in 1964 with Ric Forman as the winemaker. Both Peter Newton and Ric Forman went on to found Newton Vineyards once Sterling was sold to Seagram in 1977. So this is an historic wine in two senses. It proved a solid experience though the aroma of bananas and sweet rather than lively aspect of flavor prevented it from being excellent. No regrets though, for one should try as many 1960s Californian wine as possible, for it is an historic period. Shipped by Neal Rosenthal. Imported by Select Vineyards LTD. Alcohol 11-14%. It smells of dust and dirt. There are some dark flavors in the mouth but the dusty, dirt aspect is less than subtle. An off bottle. Not Rated. Alcohol 12%. The nose reminds me of red fruit and bananas. In the mouth are clean flavors of red fruit which are sweet. With air this becomes quite a mouthful. The assertive acidity brings forth a burst, of sweet flavor. It leaves the impression that this was a larger, slightly sweet wine in youth. *** Now. With dinner we sat down to some serious wine. The glass bottle of the 1961 Drouhin, Domaine General Marey-Monge, Romanee St-Vivant was covered with cellar grime and label damage from racking. It is one of those bottles whose provenance was lost over the years or decades. There was a fair bit of ullage but the color through the green glass, though light, reminded me of watered down cranberries which is a good indicator. With a gorgeous nose and lively flavors, there is much on offer with this wine. If I nit-pick, it does not have the harmony of the 1964 Momessin, Clos du Tart but it has personality. I really like this type of wine. Just one year younger the 1962 Chateau Lafite-Rothschild, Pauillac had very top-shoulder fill just below the neck. 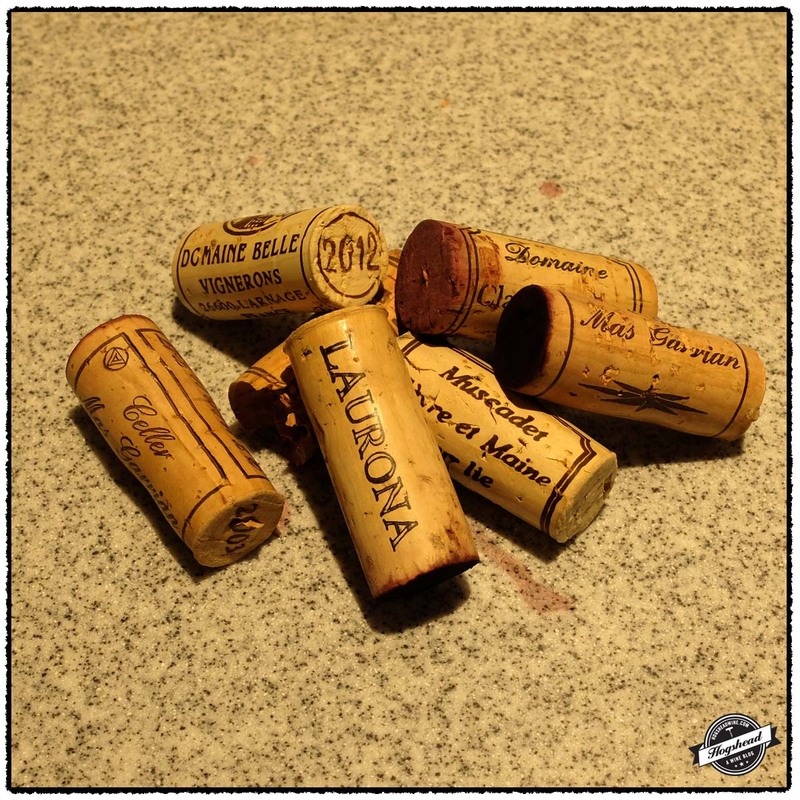 This was my first experience with Lafite. Yes, I have sadly written about more older vintages than the number of bottles tasted. Still this proved a great start. The nose is great, unique, and worth spending some time on. In the mouth this is a fully mature wine with just a touch of fat and graphite. I admit the 1945 Chateau Calon-Segur looked horrible. As you can see by the picture, it still does, with the label almost falling off after lying in my equally old Eurocave. Inside the glass is what counts so the top-shoulder fill, dark color, and firm cork waylaid some fear. All of that aside, being of the 1945 vintage and bottled by John Harvey & Sons of Bristol, where I spent my sophomore year abroad, warranted trying it out. The color is the darkest of all opened that night. The nose and the flavors are marked by eucalyptus with bright, tart, red fruit. In the end it is a relic. With calls for more fruity wine I selected the 1979 Chateau Cabrieres, Chateauneuf du Pape. The fill was excellent and the capsule contemporary so I suspect this is an ex-domaine release. I cannot imagine someone would fake a modest vintage of Chateauneuf du Pape. I liked it a lot. To me it offers a balanced, mature Chateauneuf. I recently wrote how I prefer equally old dessert wine following an old wine tasting. I am happy to report that the 2009 Chateau Suduiraut, Sauternes marks me wrong. It is incredibly complex and flavorful both on the nose and in the mouth. This is an outstanding wine. Imported by Dreyfus, Ashby, & Co. This is almost light brown in color. The nose, though, is gorgeous with aromas of cranberry and vintage perfume underpinned by an earthy note. With air it develops both bacon aromas and hints of smoke. In the mouth the vintage flavor tastes sweeter with air. This is a vibrant wine with fine acidity. As should be the case, this old Burgundy develops with air, improving at first then maintaining its lovely state until finish. **** Now but will last for a decade. Shipped by Mestrezat-Preller. Imported by White Company Ltd. Alcohol 11%-14%. The nose is aromatic and beautiful from the very first pour. It sports sweet, unique aromas of blood and iron. In the mouth are bright, clean red fruit which follows the nose. There are hints of fat and hints of dry graphite. This is drinking at its peak. **** Now. Bottled by John Harvey & Sons of Bristol. The color is remarkably dark but of proper garnet brown. There is a fresh nose of eucalyptus and dust. Similar eucalyptus mixes with bright, tart red fruit carried through with watering acidity. There is even some structure. *(*) Now. Alcohol 13.5%. The nose smells of a library and garrigue. This wine peaks after 10 minutes providing an attractive blend of blue and red fruit, garrigue, and leather. Everything is in balance with this properly mature wine. It still suggests at ripe fruit. *** Now. The nose is amazing and almost effervescent as the aromas fly out of the glass. In the mouth is a core of butterscotch flavors, ripe pineapples, and sweet cream. This racy wine is already, impressively complex. Why not drink it now? ****(*) Now – 2036. Phil recently stocked the shelves with a wide range of wines, including the three bottles of Gamay featured in this post. 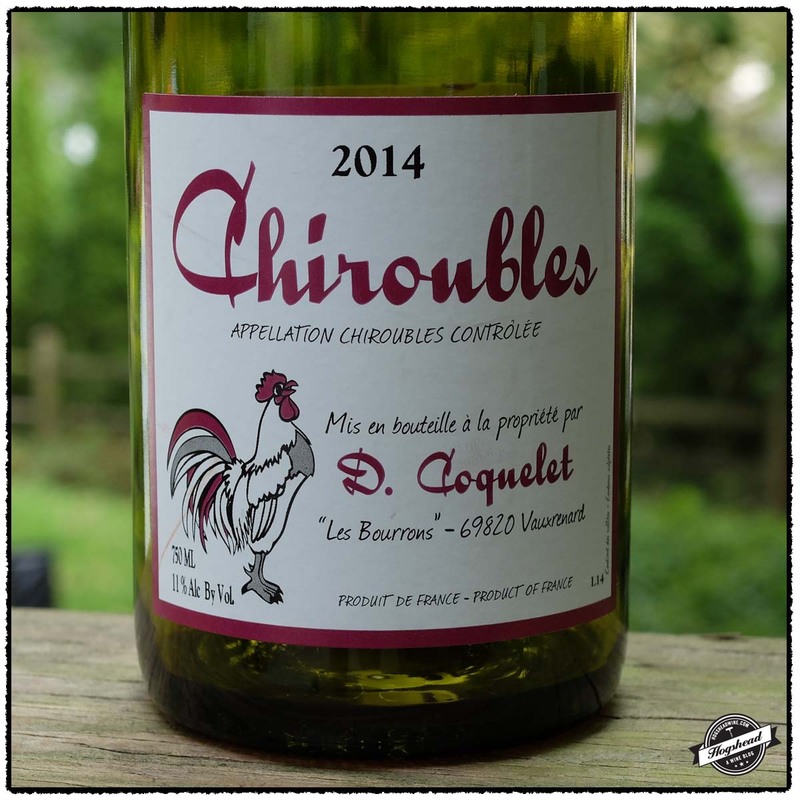 Given previous experience it is no surprise that I really enjoyed the 2014 D. Coquelet, Chiroubles. This is a pure, captivating wine that should continue to improve through the winter. 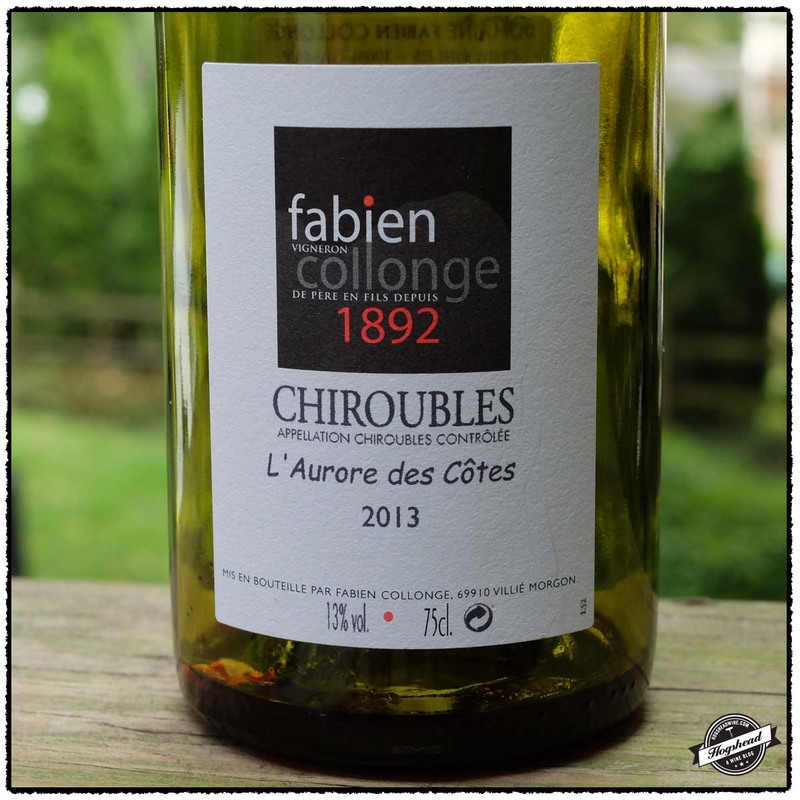 As a completely different example of Chiroubles, the 2013 Fabien Collonge, L’Aurore des Cotes, Chiroubles is blacker and deeper in fruit with more obvious structure. This could be a good gateway wine for those who prefer riper wines. 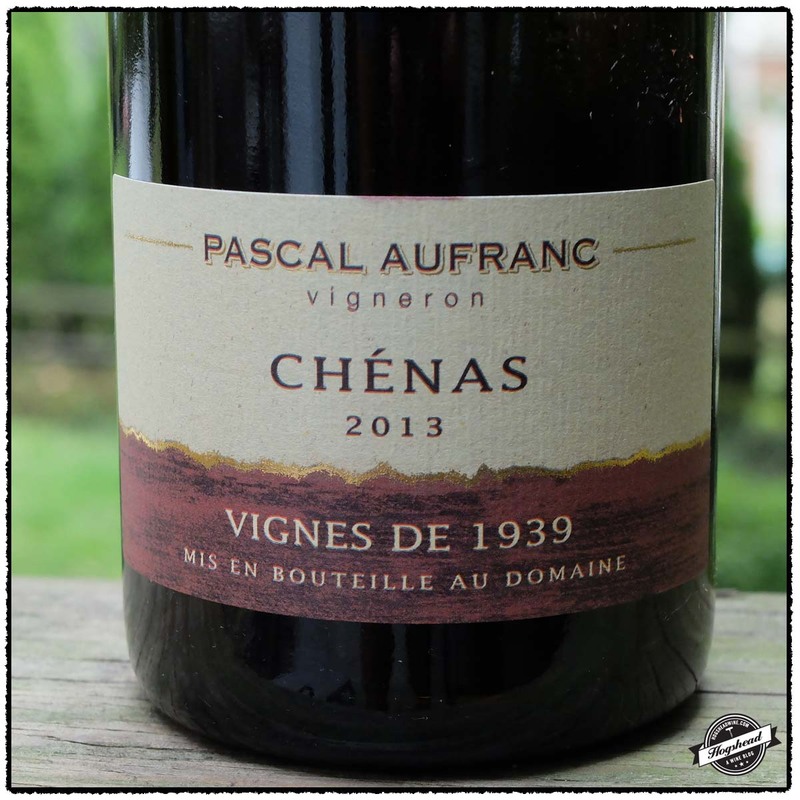 Moving to Chenas, the 2013 Pascal Aufranc, Vignes de 1939, Chenas is produced from rather old vines. I recommend you let this develop into the winter or longer but right now the orange-citrus backed red fruit is really cool! Try them all! These wines are available at MacArthur Beverages. Imported by Louis/Dressner. This wine is 100% Gamay. Alcohol 11%. The varietal Gamay nose was pure and articulate becoming even more perfumed with air. In the mouth, the slightly tart red and black fruit was lighter; framed by structure and enlivened by watering acidity. With extended air the lovely balance was captivating, showing off the perfumed flavor throughout. The mineral flavored middle mad way to a satisfying, textured finish, and the slightest yeast hint in the aftertaste. *** Now – 2018. Imported by Constantine Wine. This wine is 100% Gamay. Alcohol 13%. The nose bore black fruit that was almost plummy and certainly deeper in aroma. The nose was matched by almost-round, mouth filling Gamay flavors that began light but moved to a ripe middle and dry finish. There was acidity on the tongue from the start and eventually perfume. The bit of structured, dry tannins suggest this will develop over the short-term. *** Now – 2020. Imported by Constantine Wine. This wine is 100% Gamay sourced from a vineyard planted in 1939. Alcohol 12.5%. The nose remained subtle with dark aromas. In the mouth were tart red fruit flavors backed by some orange citrus and a little bit of weight. It eventually took on some cranberry-grape flavors and exhibited the potential for very short-term development. **(*) 2016-2019. Lou came over last week for another casual tasting. 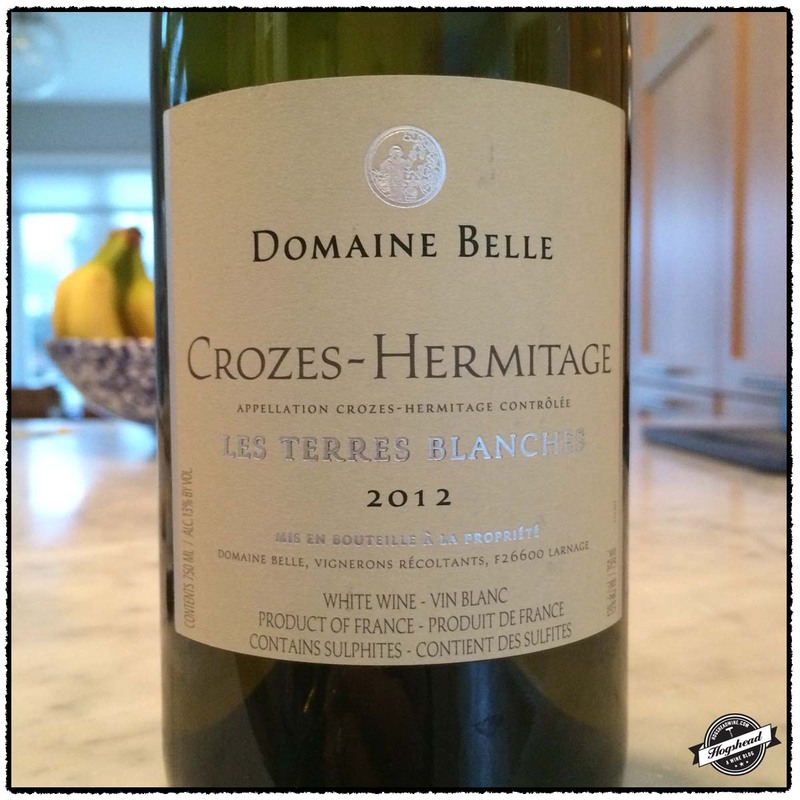 I had opened up the 2012 Domaine Belle, Les Terres Blanches, Crozes Hermitage Blanc as Jenn and I prepared the table. White Rhone wines are new territory for me. There was nothing but pleasure when we each tried our first taste. On the first night it was more vibrant and textured whereas on the second night it was smooth and mature. If you are looking for a new white wine then you must pick up a bottle. Imported by DS Trading Co. This wine is a blend of 70% Marsanne and 30% Roussanne sourced from vines on soils of clay and limestone. The fruit was fermented in 20% new oak barrels, 50% one-year old oak barrels and 30% in stainless steel vats then aged for 11 months in the same vessels. Alcohol 13%. There was textured, slightly lively white fruit at the start. The smooth flavors matched the nut aspect that was balanced by noticeable acidity on the tongue. There was a gentle finish of stones followed by a persistent aftertaste. The wine seemed young on the first night but was perfectly mature on the following night. ***(*) Now-2020. Lou supplied this flight in brown bags with his only revealing clue that they were all pre-2005. Blind tasting is fun since I am not embarrassed by my guesses. That the first wine was Riesling was fairly obvious but my conclusion of it being an old New York state wine was off the mark and continent. 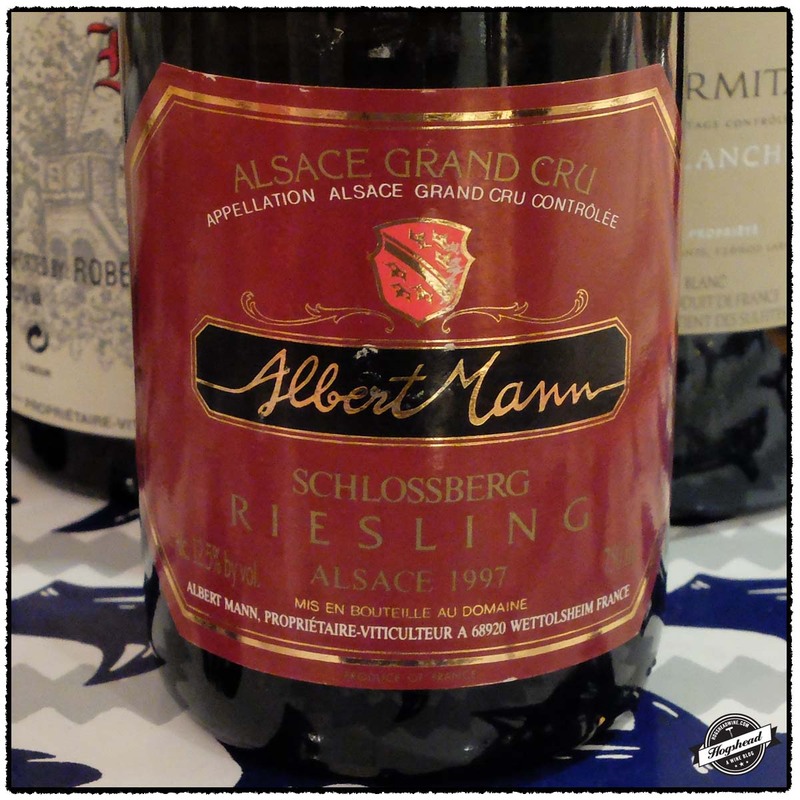 The 1997 Albert Mann, Riesling, Schlossberg Grand Cru showed a bit of a split personality with its youthful start and finish of beyond-mature flavors. It is a solid wine that is best drunk up. 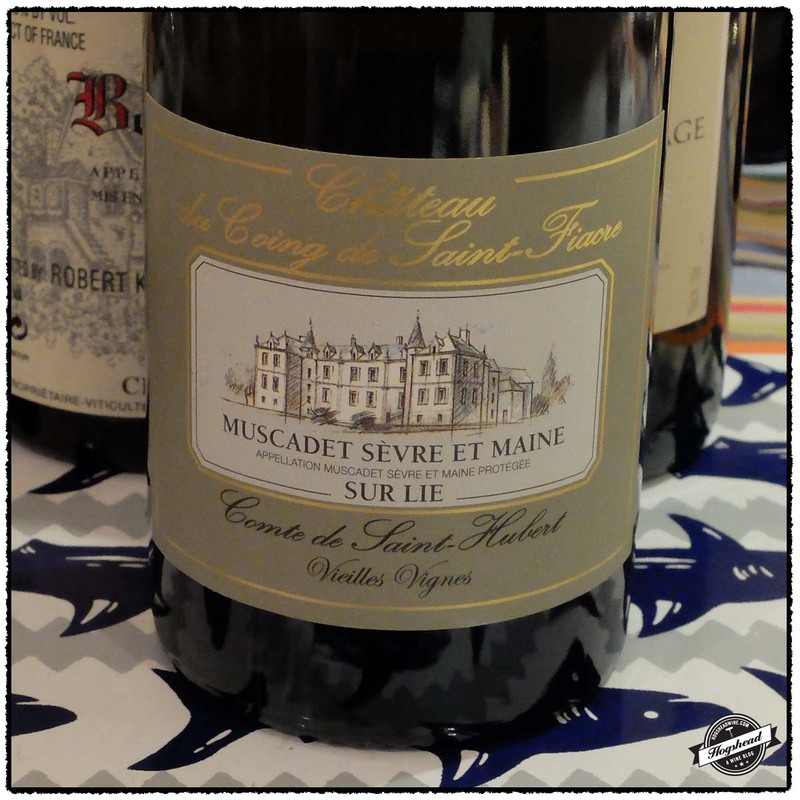 The fresh, articulate nose of the 2000 Chateau du Going de Saint-Fiacre, Comte de Saint-Hubert, Vieilles Vignes, Muscadet Sevre et Maine did not prepare me for smooth, nutty flavors in the mouth. On the first night I thought this a great wine to smell and taste with some evocations of the sea. On the second night the nose became too funky for me. This current release is only $20 so I will grab another bottle to try again. Worst case, drink this wild wine on the very first night! 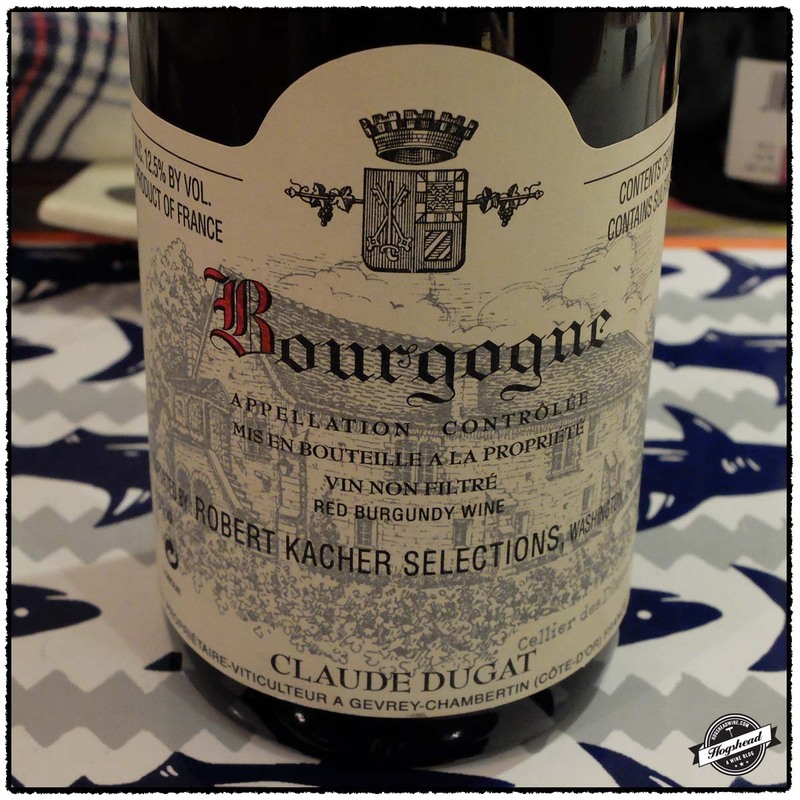 I guessed everything wrong about the 2001 Claude Dugat, Bourgogne. For a basic Bourgogne it is rather serious stuff. It responded well to air on the first night where it showed a bit of everything. Imported by Weygandt/Metzler. This wine is 100% Riesling sourced from vines on soils of granite. Alcohol 12.5%. The color was a light to medium golden amber. It smelled of mature Riesling with a hint of stones. It had a more crisp start that carried young flavors. These morphed into mature flavors with some old wood and still some ripe, tannic grip in the short finish. On the second evening it had a good mouthfeel with more prominent old flavors, dried herbs, and a tart finish. ** Now. Imported by Williams Corner Wine. This wine is 100% Melon de Bourgogne sourced from 100+ year old vines. The wine was aged sur lie. Alcohol 12%. There was a fresh, articulate nose of white fruit that on the second night was funky, dusty, and smelled of the sea. In the mouth, the almond flavors were smooth, engagingly floral, and mixed with white fruit. The wine was cool in nature with integrated acidity and a shorter, watery finish. With air the flavors became cheesy. *** Now. Imported by Robert Kacher Selections. This wine is 100% Pinot Noir sourced from parcels on Gevrey. It was fermented in concrete vats then aged for 14 months in used neutral French oak barrels. Alcohol 12.5%. The color was a medium garnet. The initial aromas were high-pitched before revealing some deep fruit. In the mouth the hint of Morello cherries were tart yet had ripeness before building racy mineral notes. The wine was lighter in the finish with flavors of tart berries, some structure, old perfume, and dry black flavors. The tannins remained on the gums. *** Now-2018. This flight was organized around two new arrivals of Mas del Camperol. Produced by Celler Mas Garrian this is the same winery that produced the excellent 2005 Clos Severj, Priorat that I reviewed in my post Two Great Spanish Wines. Priorat and Montsant are neighboring regions so I added the 2004 Celler Laurona, Montsant to the mix. All three of these wines benefited from air and I thought tasted better on the second night. 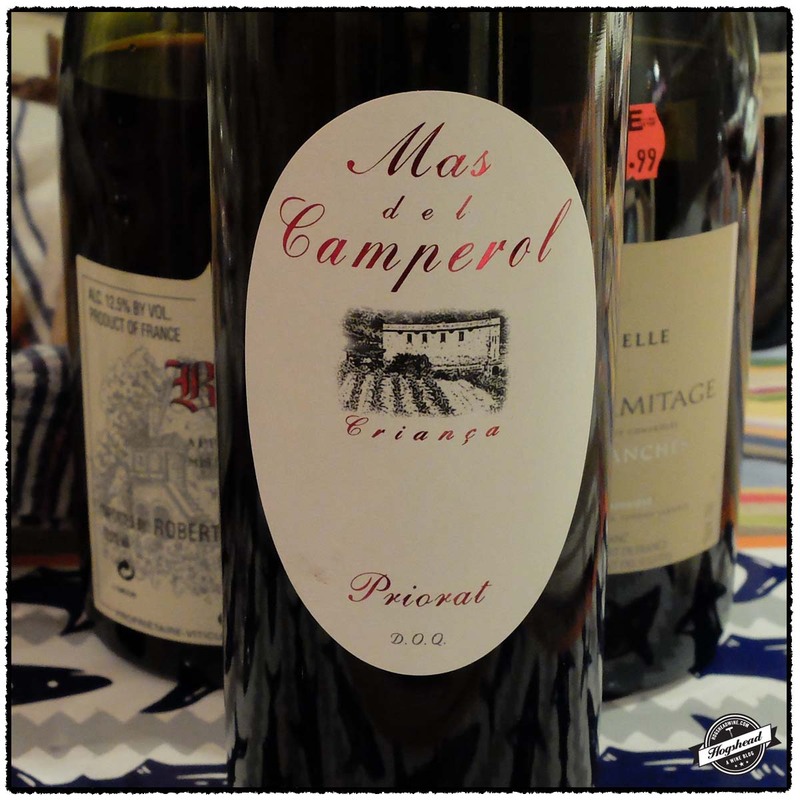 The 2004 Celler Mas Garrian, Mas del Camperol, Priorat was the most interesting of the bunch. It exhibited consistently greater complexity, poise, and will continue to develop for years. The Priorat sun comes through at first but it does balance out. 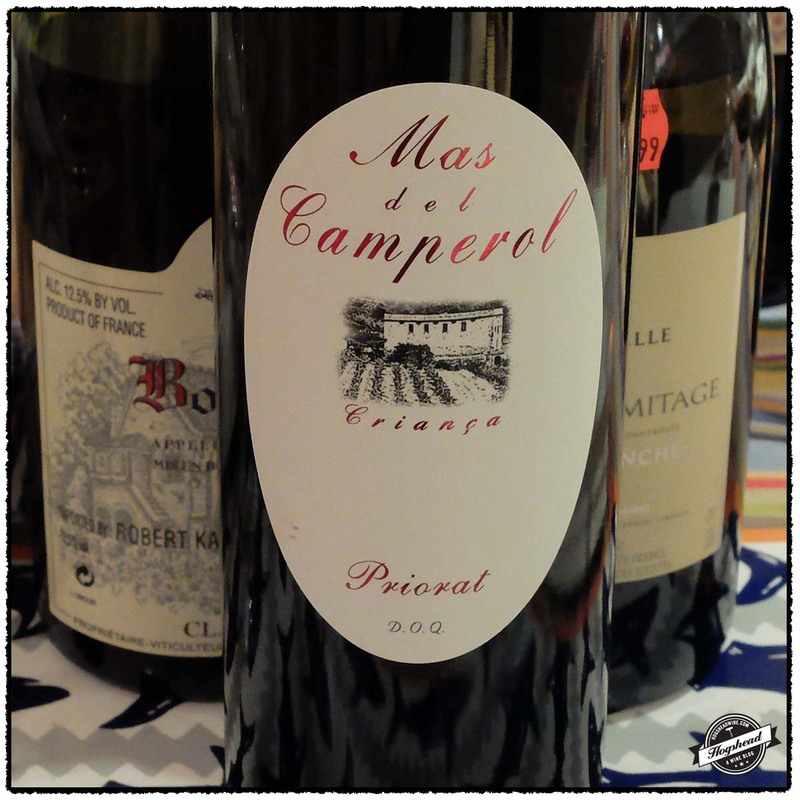 The 2003 Celler Mas Garrian, Mas del Camperol, Priorat exhibited brighter, cleaner flavors with notes of dried herbs. Tasted alongside the 2004 the reduced complexity is noticeable so I would drink this alone. 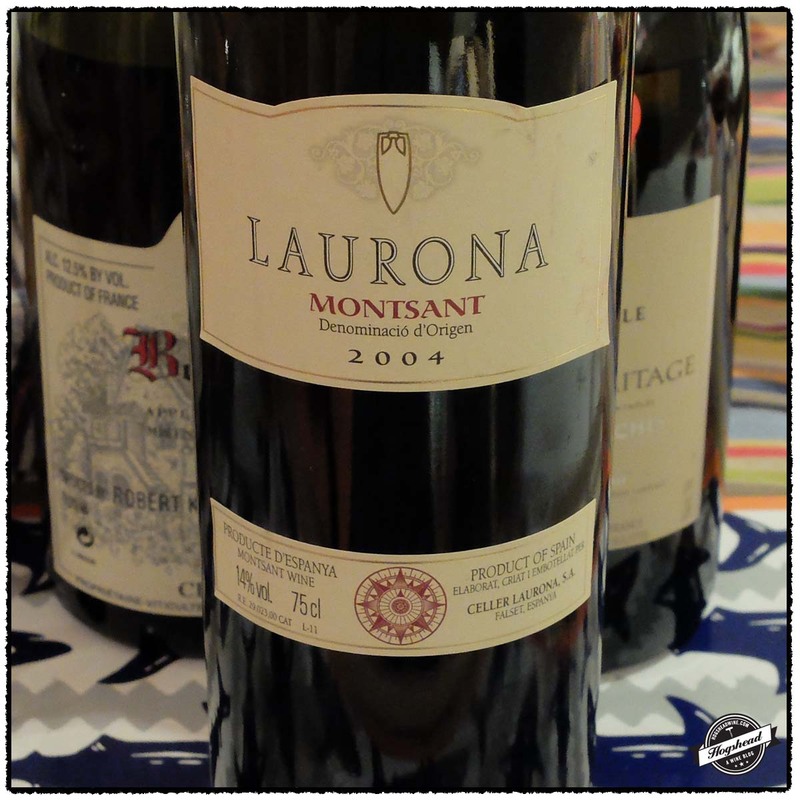 I agree with Lou that the 2004 Celler Laurona, Montsant was the more coarse wine of the three. It did come together on the second night where it had some complexity as well as old wood notes. I do not think it will make old bones like the 2004 Mas del Camperol so why not drink it on a crisp spring night! Imported by Williams Corner Wine. This wine is a blend of blend of 30% Garnacha, 30% Cabernet Sauvignon, 25% Carinena, and 15% Syrah from the estate’s older vineyards that was aged for 13 months in a mixture of new and used French and American oak. Alcohol 15%. The nose revealed Kirsch and dried herbs. In the mouth this flavorful wine was grippy with building power and brighter acidity. With air, the racy cherry flavors continues. The aromas and flavors were consistent throughout, leaning towards the clean side. The structure was noticeable on the gums as the aftertaste had good length. *** Now-2025. Imported by Williams Corner Wine. This wine is a blend of blend of Garnacha, Cabernet Sauvignon, Carinena, and Syrah from the estate’s older vineyards that was aged for 13 months in a mixture of new and used French and American oak. Alcohol 15%. The initially ripe, rasinated fruit became more attractive with aromas of ripe, musky, generous fruit. There were deep fruit flavors, some maturity, and greater complexity with air. There was good structure for development. **** Now-2025+. Imported by Europvin. This wine is a blend of of 50% Grenache, 25% Merlot, 15% Syrah, and 10% Cabernet Sauvignon. Alcohol 14%. The nose was a little plummy with some funk. It did not have as much depth and came across as coarse but with air it became less forward with better balance. There was decent complexity, some old wood but it still seemed fresh. It maintained a coarse nature with less strength. ***(*) Now-2025.